Well, it’s been about a week since the Las Vegas Market came to a close and I have been finding myself thinking back on what a great market it was! I have always attended markets as a Designer; focusing on shopping “what’s new” for my clients and seeing emerging trends in home decor first hand. Since becoming Brand Ambassador for Howard Elliott, the markets have taken on a new meaning. I now get a glimpse of what’s “Behind the Curtain” and see the market from a different point of view, that of the manufacturer. Truth be told, Howard Elliott is not under new management. They have taken a step forward and identified who they are as a company and where they want to go and they are executing upon that vision! I love hearing that the direction Howard Elliott is moving in is nothing like what anyone else is doing. 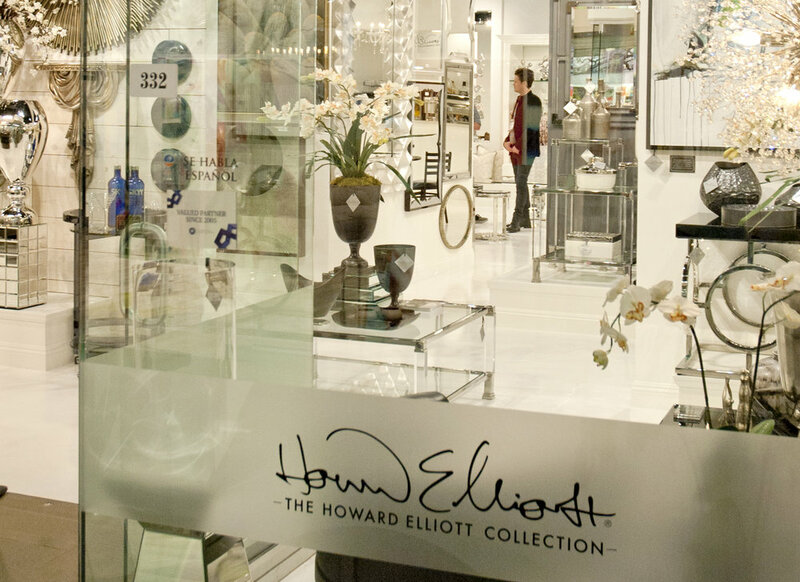 Howard Elliott is developing their own unique look and setting the trends, instead of taking a reactive approach. This renewed strategy began this past October in High Point and then perfected through January in Las Vegas. Jody Ossman, Howard Elliott’s Design Director, removed everything from the showroom, knocked down walls, and started over with a blank canvas. The end result became a new floor plan to allow for better flow, newly constructed open plan shelving, painted the entire showroom white which allows the products to shine and create a visually pleasing experience. New products were merchandised in prominent positions, while pieces that have been in the line for quite some time were given new life in the refreshed setting. I heard some people say, “Oh Wow! Look at that new mirror. I haven’t seen that one before” of a piece that has been in the line for several years. This speaks volumes to the timelessness of many of the Howard Elliott products. In addition to the many new faces we saw at the Las Vegas Market, we were thrilled to have Christopher Grubb, House Tipster host, stop by the showroom to speak with me and check out our new look! All in all, the direction that Howard Elliott is going is great, not only with our image, but with the product as well. The team is continuously working and reviewing the line; finding gaps in the offering and delivering products that round out the collection creating a very robust presentation. BUT! This is only the tip of the iceberg, a precursor of what is to come! Just wait until you see what we have in store for you in High Point!